"Lock Down" was the title of a student-produced town hall forum held March 21 to focus on gun violence and school safety. Recorded in the television studio at Sabin-Schellenberg Professional Technical Center, just east of Milwaukie, the forum is being shown on Clackamas County educational acce ss Comcast channels 27/28. The center seeks to educate leaders through creating professional experiences in numerous fields. Students from all high schools in the North Clackamas School District may attend classes at Sabin-Schellenberg, and this live town hall forum was produced by those in the broadcasting and social media program, with assistance from the journalism program. 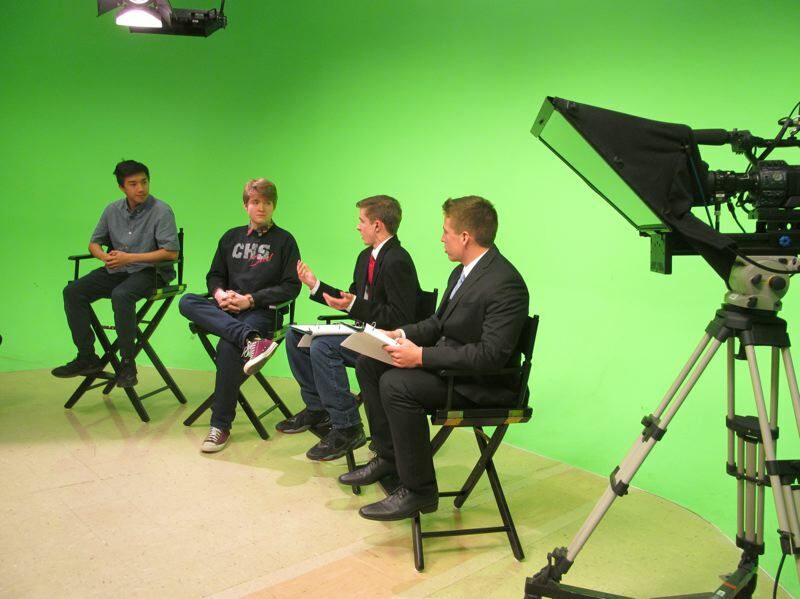 Before the broadcast began, student anchors Jake Bushman and Zach Murray, both juniors at Clackamas High School, noted that the event was a good way to give local students a voice in a national issue. "We are the future, and if students continue to die, where's the future?" Murray asked. "If students speak out, it helps the whole district," Bushman said. He added that an event like this one helps get the word out that students from the Northwest support those who have faced school shootings. As student directors counted down to begin the show, Deborah Barnes, broadcasting instructor at Sabin-Schellenberg, reminded attendees that the broadcast was live and noted that the journalism students should be prepared to ask questions during the event. Bushman and Murray first interviewed Matt Utterback, superintendent of the North Clackamas School District, and Rein Vaga, school board chairman. They asked what the school district is doing to keep students safe. Vaga said he is glad events like the town hall give young people a chance to speak out. "These events are so horrific — we need to hear your voice to help improve safety," he said. Utterback noted that looking at schools from a safety perspective requires the input from law enforcement, security experts, school leaders and parents. "It takes a whole community to ensure that we feel as comfortable as we can," he said. "We have retrained all our administrators and counselors in a threat-assessment model in order to give students all the help they need." Statistics have shown that 80 percent of school shooters are former or current students, so it is important to create a safe environment for students to tell school staff if they have concerns about people they see as potentially threatening, he said. Utterback also pointed out that "locks, lights and get out of sight" works in a school-shooting incident. "In only one incident has a shooter come through a locked classroom door. The best thing is to get out of sight in a locked space." People don't like to hear it, but unfortunately "someone intent on causing harm will find a way to cause harm," Utterback said. He asked students if they wanted an open school environment or a more prisonlike one with chain-link fences and more security guards. "That is the balance we wrestle with. I want our schools to be more welcoming, instead of hardening our schools," Utterback said. Vaga added that it is "heart-wrenching to see kids running for their lives. We will do whatever we can to make schools safer." Milwaukie Mayor Mark Gamba was the next to be interviewed by Bushman and Murray. He is not a fan of turning schools into prisons or arming teachers; instead, he said, "we need to work more with mental health as a society, and make more mental health care available to students in schools." Gamba said he grew up in Colorado and, as a hunter, took gun-safety courses. "We learned as young kids that guns were dangerous, and we were taught to respect guns. But the difference now is that military-grade weapons are available." As for safety in the city of Milwaukie, "we have an extraordinary police force and sheriff's department. Our officers are well trained and will react decisively" in an active-shooter situation, Gamba said. Seniors Bobby Campbell and Artthew Ng, student leaders at CHS, spoke to Bushman and Murray about what it was like to organize the recent student walkout on campus. They said they thought it was important to "stand in solidarity" with students across the United States who walked out of schools to support the survivors of the Feb. 14 shooting at Marjory Stoneman Douglas High School in Parkland, Florida. "We were happy it turned out very well; the people there were moved," Ng said. The CHS walkout was "not muddied by a political agenda. There is an epidemic raging through the country, but we wanted to honor the lives of those kids," Campbell said. They emphasized that the walkout was not mandatory, and some students chose not to participate. Bushman noted there were some negative comments on social media about the walkout, remarks describing it as a waste of time. "Seventeen minutes is not too much time to honor the lives of those who died, and then we all returned to our classes," Campbell said. When asked if students learned something from the walkout, Campbell said that organizers read the biographies of the people who died, so students learned empathy. "Those biographies proved that all these people who die in school shootings are not numbers — these were people," Ng added. 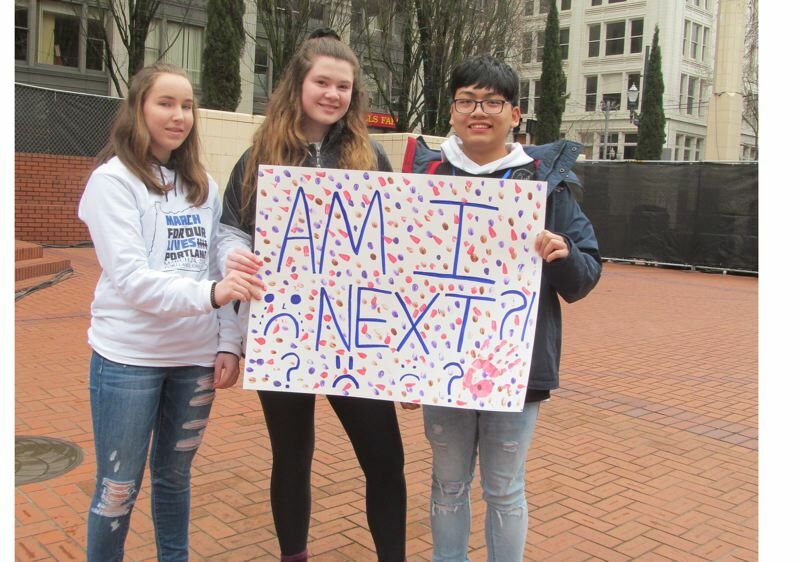 Both Campbell and Ng said they will attend the March For Our Lives event in downtown Portland on March 24. Next, U.S. Democratic Rep. Kurt Schrader was shown in a video clip, discussing gun safety issues. "I believe in the Second Amendment, but I don't want guns in the hands of someone who shouldn't have them," he said, adding that mental health programs need to be strengthened. When asked what he would say to students who are afraid to go to school, he replied, "Don't let these few people destroy your opportunity to get an education. Just make sure you know what to do" in an active-shooter situation. As the town hall wrapped up, Bushman and Murray shared their thoughts about what they had heard. "We trust 100 percent in the school district," Bushman said. To the students present, he added, "Keep doing marches and getting out the word one step at a time." "Don't be afraid to state your opinion," Murray said, while Bushman added, "Be aware of your surroundings, and don't take life for granted. To learn more about the Sabin-Schellenberg Professional Technical Center, visit nclack.k12.or.us/sabin/page/sabin-schellenberg.